Our goal at Snapfuze is to make your event more memorable. Even if we’re not the right fit for your event, we want you to be happy, so we’ve decided to put some time into helping you pick the DJ or Photo Booth vendor for your event with a two-part article. In part one of this article we’ll focus on what you should know before hiring a Michigan DJ service. Some things like a bad attitude, or poor initial service are obvious no-no’s, but we’d like to let you in on some industry secrets so you don’t end up underwhelmed and needlessly angry like the woman in the photo above. Tip #1: Choosing musical entertainment is in the top 3 most important choices you’ll make for your event. In a Wedding Entertainment survey conducted by The Knot, USA Today and Brides Magazine, 72% of all brides say they would have spent more time choosing their reception entertainment. 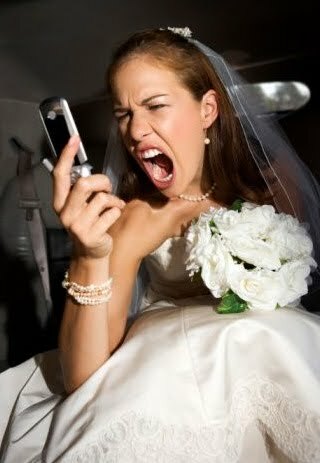 When asked, 81% of all guests say the thing they remember most about a wedding is entertainment. The DJ will often provide atmosphere from the start to finish of your event. Outside of the venue, the DJ is the other aspect that’s always present throughout the entire event. Don’t underestimate the value of a good DJ. Tip #2: Consider a DJ with experience outside of DJing private events such as weddings, birthday parties or corporate events. DJs that are one dimensional tend to play the same songs in the same order at every event. We’ve heard complaints from previous events our customers attended that typical wedding DJs let every song play to the end even if it was a bad choice and clears the dance floor. A DJ with more experience would see the dance floor begin to clear and would immediately have another guaranteed hit song ready to mix in. Experienced DJs trained in a Nightclub atmosphere are less likely to give off a corny ‘game show host’ vibe, but hiring a DJ that’s ‘too cool for school’ can also have disadvantages. At a concert or nightclub people are there to see you perform, but as a wedding DJ, you must understand the DJ should never be the star of the show. Make sure you feel comfortable that the DJ you’re hiring will not only be skillful, but will also value the significance of your event. Tip #3: As you interview the DJ, listen to his or her words. Are you and your guests the main focus? In order to answer this question you must be speaking with the DJ who will provide the entertainment at your event. You don’t want to be sold on one person only to find out they’re just the customer service rep, and your DJ is much less personable. If a DJ company seems more focused on everything but the music that will make you and your guests enjoy themselves, that should be a huge red flag. Let me say that one more time. Quality equipment, lighting & speakers are important (and we have to admit we’re equipment snobs), but if your conversation with a potential band or DJ is centered around anything but making you and your guests happy, be very concerned! Hopefully, these tips will help you choose the right DJ for your event. If you’ve have any questions we didn’t answer, leave them in the comments below. With Snapfuze DJ Services you and your guests are always the main focus. We create custom playlists for each of our events, based on your suggestions and requests. Read a few of our reviews and contact us today if you’re interested in learning more, about Snapfuze Wedding DJ services. We couldn’t agree more. We tell our clients the very same thing – some take the advice, others don’t,but you guys are right on.